Competition 1:8 Det finns 8 produkter. The expansion of 1:8 scale electric series goes into the next round. Now comes from the successful Team C champion forge the T8TEV2. 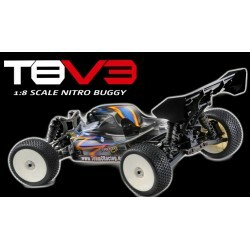 This new truggy kit offers many new features. The machines are never still at Team C. Thus, from the GT8 (short version) the GT8L (long version) is produced. The difference between those two vehicles alone is the length. If you enter a competition with the goal to win, the GT8L is your tool.